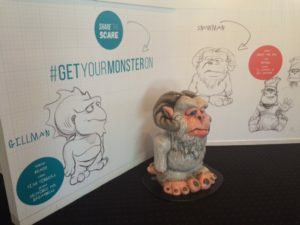 Artist John Cox’s exhibition at the Gold Coast Arts Centre, How to Make a Monster, is a winner for family-oriented fun. The colourful, interactive and slightly scientific exhibition offers a unique insight into the intriguing world of animatronics. The first hall of two is home to the Academy Award presented to John Cox’s Creature Workshop for their work on the 1995 children’s film classic, Babe. There are also storyboards from George of the Jungle 2, the parrot (and all its mechanical insides) from Peter Pan and in the middle of the room stands a bizarre aquatic creature named Gillman, showing how he was brought to life from a paper drawing. The second hall displays the animatronic cast from Racing Stripes, plus public works Mr Cox has completed, such as the girl and bear sculpture Maddie and Mike (2010) and the koala sculpture trail Animals with Attitude (2013). The behind-the-scenes movie reel depicting how the often-huge creatures were brought to life is certainly worth a look too. Despite animatronics being almost completely replaced by computer-generated imagery today, the amazing mechanics behind the industry and bizarre props are sure to fascinate both adults and children alike. The exhibition runs from 25 March to 12 June at the Gold Coast Arts Centre.